It struck me that while this article wasn’t directly related to my task at hand, it was actually a peculiar insight into the vocabulary used in the burlesque industry, and it contains the sort of information that often gets lost over time. In addition to being an interesting and somewhat appalling article (to be fair to the Star, most of the worst lines are quotations attributed to the New York chorus girl scout), it could also be a useful article for anyone interested in theatre and/or feminist history. Thus, I’m thus including its full text below, so that search engines might pick it up. Annotations in square brackets are my own. Toronto is now on the theatrical map as a city from which a supply of chorus girls can be drawn. Leon Berg, the general representative of Hurtig and Seamon [Noted New York City burlesque producers, perhaps best known today for opening a theatre in Harlem which later became the Apollo], producers of musical comedies and burlesque shows, is in the city [of Toronto] and he is on the hunt for pretty girls who can dance and sing. To the Star he stated that he had found but few candidates in his short stay here, but he knew that there were many Toronto girls in chorus ranks, and he hoped to get more of them for the Hurtig and Seamon shows. “The selecting of a chorus for a musical show is a most difficult undertaking. The girl with a pretty face and a good form may not qualify as singer or dancer. For this reason the producer is often compelled to overlook either the one or the other shortcoming. Incidentally, it might be well to mention that chorus girls start this season at an average of $18, and after a season’s experience they can count on $20. The margin of profit is small when a girl pays for her sleeping car berths [most burlesque companies would travel from city to city, playing week-long engagements], her tights, her hose, and shoes for stage use, her hotel expenses, etc. Wise girls won’t leave happy homes, even for Mr. Leon Berg. 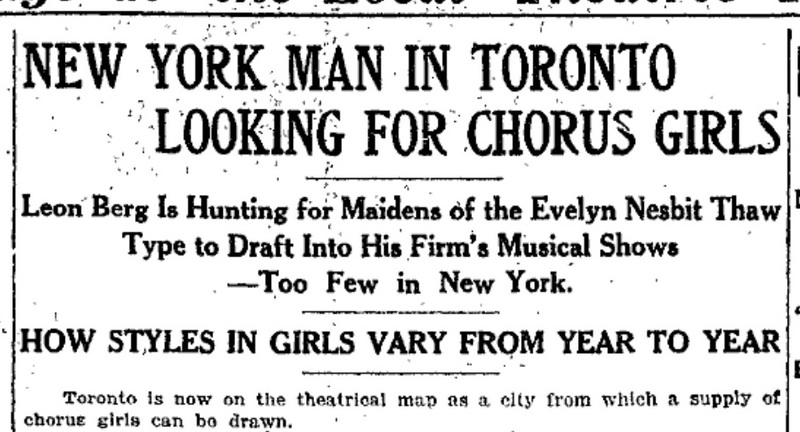 It is estimated by local theatrical people that there are over 100 Toronto girls now in the ranks of the chorus. This entry was posted in Historical Interest, Theatre, Torontoist, Ward 28. Bookmark the permalink.